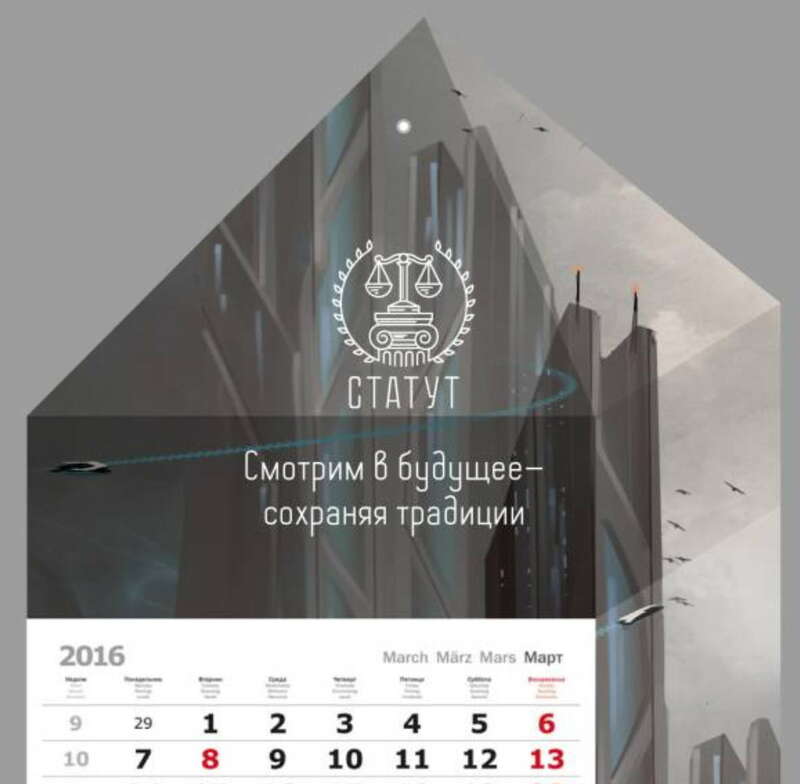 What is the cost and what the development of the design depends on calendars? Calendar - one of the essential attributes of the life of every business person, pay due attention to the planning of upcoming events and everyday activities. Besides, calendar capable address corporate image component, working on the reputation of the company throughout the year, be a great gift for your business partners and take on the role of an effective advertising tool. Originally designed calendar, wall or table, in addition to its functionality and usefulness, It is able to bring to the interior of the cabinet aesthetics and touch of creativity. This calendar view allows the designer to use the most interesting and creative process with the maximum degree of freedom. Its components are part of the advertising and graphic calendar grid, which can be decorated with absolutely unique. From the perspective of, are put before the calendar, it can be minimalist, functional, fully bright decorative or advertising. Настольный календарь в виде «домика» украшает подавляющее большинство столов офисных работников. Regardless of the position, officials repeatedly refer to it throughout the day. Original design desk calendar, decorated by all the rules and stood in the original style of the company, not only to decorate the workplace, but also emphasize the solidity and prospects of the company, to win new partners and clients. The most common business-presenting a quarterly calendar. The classic version of the model is composed of three blocks: graphic design in the upper part, calendar grid and the bottom of the ad unit. The distinguishing feature of this type of calendar – the opportunity to experiment with the logical structure of his design, it is not possible for other types of. The design is not limited to calendar quarter standard options: he may have a minimum calendar grid, three ad in the middle of the field, or one on the right, etc. This gives full freedom for the realization of the wishes of the customer. Pocket calendar - multifunctional compact object, is a successful synthesis of business cards and leaflets. This kind of printed products efficiently perform advertising functions, and acts as an assistant guide for eventful life, as well as a popular souvenir. Properly created corporate calendar - the "long-playing" promotional tool. That is why in the course of its development should make every effort, to design a wall calendar or any other of its type has been able to cope with its core function. Typing game beautiful, for example, quarterly calendars, imagine, that all available space can be occupied by your company logo, slogan and advertising text. obviously, such that the printed products will be appropriate to place only in his office or in the friendly companies. The rest of it is just not interested. Because our goal is another, should apply more creative, and at the same time simple and effective approach. People are happy to decorate a wall or a table with calendar, that they like. Therefore, on the free site for the graphic calendar should put the aesthetic image, perhaps even with a good sense of humor, which does not necessarily have to be directly related to your business. the main thing, to its style it coincides with the corporate culture of the company and its marketing strategy. calendar print design, wherein skillfully connected usability, functionality, interesting content and advertising on site, It will be the basis for a marketing tool, who will work for you for a year. This, unnoticeable, at first sight, advertisement, It has a high cumulative effect! How much is the design of the calendar? How much is to impose a calendar? A ready answer to these questions does not exist, as the price is formed, based on a number of factors. It is influenced by the level of complexity of the layout, the need for the development of new technologies and materials, amount of time, spent by the designer on the development and approval of the sketches of the finished layout, Order Deadline, issued to customers. Proper creation of a calendar layout - this is only half the battle, не менее важно и его высококачественное изготовление из первосортных, practical and hard-wearing materials. A really good calendar - especially, handy calendar. If he does not meet this criterion, people do not want to use it, which is why he can not fulfill its advertising function. Largely depends on the convenience of the quality of materials, so to save them is not necessary. Most often, the calendars are printed on coated paper, a density of about 150 g / m², for the cover and the substrate using a higher density paper – 200-220 g / m²., Pocket calendars suitable cardboard. The least demanding and most budget option - tear-off model. For such calendars can be used inexpensive newsprint type. 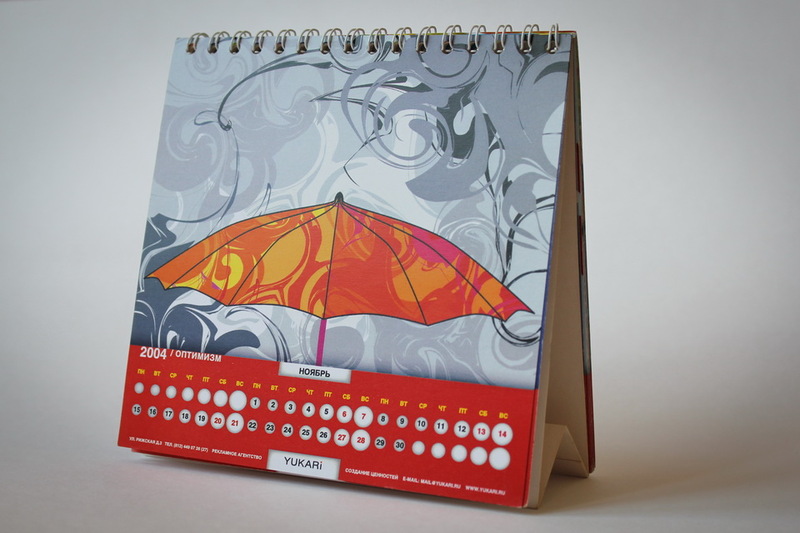 Just look beautiful calendars, printed on the design paper, but their cost is much higher. At the first stage the customer informed about their wishes, including the smallest details, on the format, font, decoration, etc.. Based on the obtained data, Artist concept forms, based on customer requests and changes made to the competent designer, and discusses the project deadlines. The result of the first phase of work - technical specification for the design of the calendar. The next step - the creation of thumbnails, an outline of the arrangement of elements. The basic functional unit of any type calendar is a calendar grid, its location determines its design. By the calendar grid extends many requirements: it should be not only functional and well readable, but also aesthetic and relevant. Another component performs its calendar graphic part. It can be executed hundreds of different ways: pencil drawing by hand, watercolor, pastels, oil, etc., to the use of photographs and photo collages, It can also be performed using a graphics tablet. In a third step is performer customer several options ready sketches, from which he selects the most favorite design for calendar. The final stage - the creation of the final layout and its approval. The result of fruitful work of designers becomes a unique layout with an exclusive graphic part and the calendar grid. printed products market is full of the same type of calendars with pictures commonplace and habitual orientation, use that throughout the whole year dull. Be brighter and more original! Creative design of the calendar - a sure way to make your company, demonstrate an unusual approach, attract new customers and partners. The cost of the layout design, concept, sketch in St. Petersburg and Moscow. Создание проекта в СПб.